24 Volt 0.5 Amp (24V 0.5A / 500mA) electric scooter/bike battery charger. 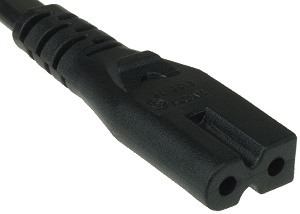 Standard 110-120 Volt AC power input. Two-color LED indicator lamp glows red when charging and green when charging is complete. This is an automatic battery charger which turns itself off when the charging cycle is complete to prevent overcharging. 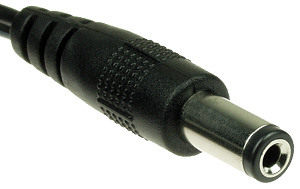 Available only with 5.5mm x 2.1mm Coaxial type connector plug. Works with electric scooters that have two 12 Volt batteries or one 24 Volt battery pack. 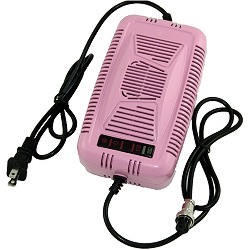 24 Volt 0.6 Amp (24V 0.6A / 600mA) electric scooter/bike battery charger. 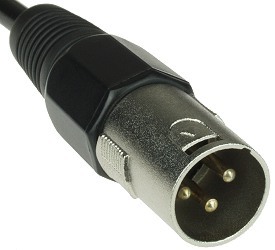 Standard 100-120 Volt AC power input. Two-color LED indicator lamp glows red when charging and green when charging is complete. This is an automatic battery charger which turns itself off when the charging cycle is complete to prevent overcharging. Works with electric scooters that have two 12 Volt batteries or one 24 Volt battery pack. 24 Volt 1 Amp (24V 1A) electric scooter/bike battery charger. 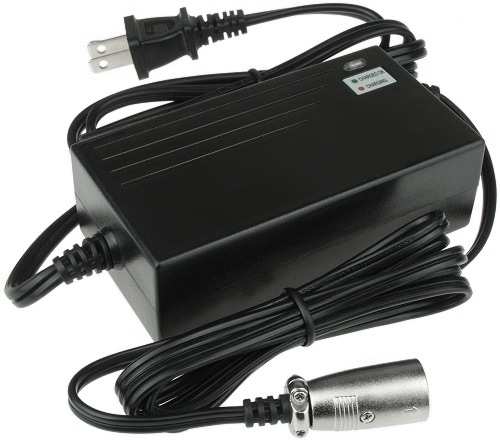 Universal 100-240 Volt AC power input. Two-color LED indicator lamp glows red when charging and green when charging is complete. This is an automatic battery charger which turns itself off when the charging cycle is complete to prevent overcharging. Works with 24 Volt electric scooters, bikes, and go karts that have two 12 Volt batteries or one 24 Volt battery pack. Razor® 24 Volt 1.5 Amp (24V 1.5A) electric scooter/bike battery charger. Standard 110-120 Volt AC power input. Two-color LED indicator lamp glows red when charging and green when charging is complete. This is an automatic battery charger which turns itself off when the charging cycle is complete to prevent overcharging. Made by Razor®. Works with 24 Volt electric scooters, bikes, and go karts that have two 12 Volt batteries or one 24 Volt battery pack. Currie® 24 Volt 1.5 Amp (24V 1.5A) electric scooter/bike battery charger. 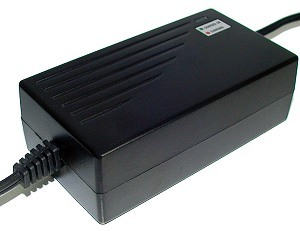 Standard 100-120 Volt AC power input. Two-color LED indicator lamp glows red when charging and green when charging is complete. This is an automatic battery charger which turns itself off when the charging cycle is complete to prevent overcharging. Made by Currie®. Works with 24 Volt electric scooters, bikes, and go karts that have two 12 Volt batteries or one 24 Volt battery pack. 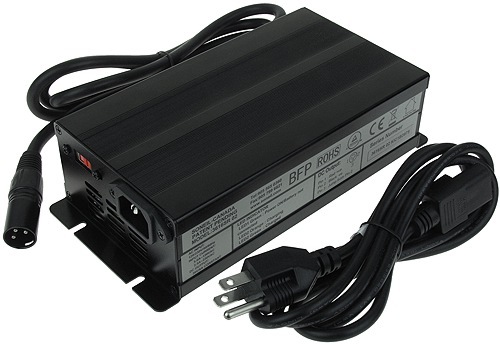 Soneil® model 2403SR 24 Volt 1.5 Amp (24V 2A) Constant Current™ battery charger. 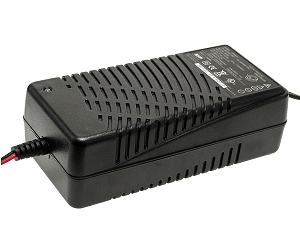 Universal 100-240 Volt AC power input. Two-color LED indicator lamp glows red when charging and green when charging is complete. This is an automatic type charger which turns itself off when the charging cycle is complete to prevent battery overcharging. 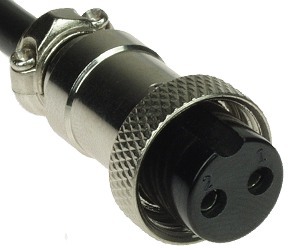 Available with Inline, XLR, House, and Coaxial style connector plugs. Includes 12 Month manufacturer's warranty. 24 Volt 1.6 Amp (24V 1.6A) electric scooter/bike battery charger. 100-240 Volt AC power input. Two-color LED indicator lamp glows red when charging and green when charging is complete. This is an automatic battery charger which turns itself off when the charging cycle is complete to prevent overcharging. Works with 24 Volt electric scooters, bikes, and go karts that have two 12 Volt batteries or one 24 Volt battery pack. 24 Volt 1.8 Amp (24V 1.8A) electric scooter/bike battery charger. Standard 110-120 Volt AC power input. Two-color LED indicator lamp glows red when charging and green when charging is complete. This is an automatic battery charger which turns itself off when the charging cycle is complete to prevent overcharging. Works with 24 Volt electric scooters, bikes, and go karts that have two 12 Volt batteries or one 24 Volt battery pack. 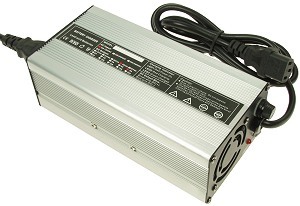 Soneil® model 2404SX2 24 Volt 2 Amp (24V 2A) Constant Current™ battery charger. 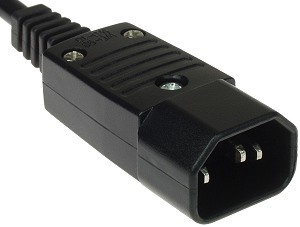 Universal 100-240 Volt AC power input. Two-color LED indicator lamp glows red when charging and green when charging is complete. This is an automatic battery charger which turns itself off when the charging cycle is complete to prevent overcharging. Works with 24 Volt electric scooters, bikes, and go karts that have two 12 Volt batteries or one 24 Volt battery pack. Includes 12 Month manufacturer's warranty. 24 Volt 3 Amp (24V 3A) electric scooter/bike battery charger. 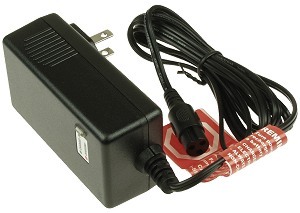 Standard 110-120 Volt AC power input. Two-color LED indicator lamp glows red when charging and green when charging is complete. This is an automatic battery charger which turns itself off when the charging cycle is complete to prevent overcharging. Currie® 24 Volt 4 Amp (24V 4A) electric scooter, bike, or go kart battery charger. User selectable 115 or 230 Volt AC power input. Two-color LED indicator lamp glows red when charging and green when charging is complete. This is an automatic battery charger which turns itself off when the charging cycle is complete to prevent overcharging. Includes 6 Month manufacturer's warranty. Soneil® model 2408SRF 24 Volt 4 Amp (24V 4A) electric scooter/bike Constant Current™ battery charger. 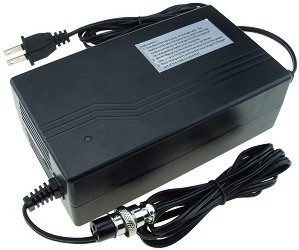 Universal 110-230 Volt AC power input. Two-color LED indicator lamp glows red when charging and green when charging is complete. This is an automatic battery charger which turns itself off when the charging cycle is complete to prevent overcharging. Includes 12 Month manufacturer's warranty. Soneil® model 2409SR 24 Volt 4 Amp (24V 4A) electric scooter/bike Constant Current™ battery charger. 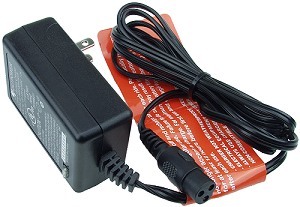 Universal 110-230 Volt AC power input. Two-color LED indicator lamp glows red when charging and green when charging is complete. This is an automatic battery charger which turns itself off when the charging cycle is complete to prevent overcharging. Includes 12 Month manufacturer's warranty. 24 Volt 5 Amp (24V 5A) electric scooter/bike battery charger. 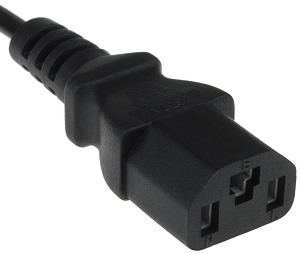 Standard 110-120 Volt AC power input. Two-color LED indicator lamp glows red when charging and green when charging is complete. This is an automatic battery charger which turns itself off when the charging cycle is complete to prevent overcharging. Works with 24 Volt electric scooters, bikes, and go karts that have two 12 Volt batteries or one 24 Volt battery pack. 24 Volt 5 Amp (24V 5A) electric scooter/bike battery charger. Pink case color. 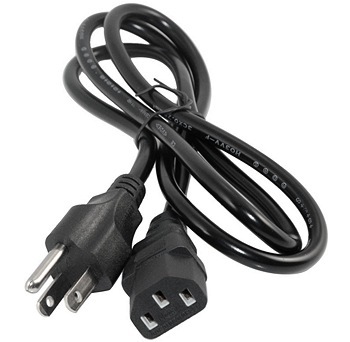 Standard 110-120 Volt AC power input. Two-color LED indicator lamp glows red when charging and green when charging is complete. This is an automatic battery charger which turns itself off when the charging cycle is complete to prevent overcharging. Works with 24 Volt electric scooters, bikes, and go karts that have two 12 Volt batteries or one 24 Volt battery pack. 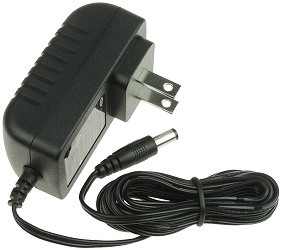 ElectriCruz® 24 Volt 5 Amp (24V 5A) electric scooter, moped or bike battery charger. 110-120 Volt AC power input. Sturdy aluminum case with power switch and cooling fan. Fuse protected, extra fuses included. Two LED status indicators glow red when battery is charging and green when the charging cycle is complete. This is an automatic battery charger which turns itself off when the charging cycle is complete to prevent overcharging. Works with electric scooters, mopeds and bikes that have two 12 Volt batteries or one 24 Volt battery pack. Designed for charging 18Ah - 50Ah SLA battery packs. Weight 3.5lbs. Includes 12 month manufacturer's warranty. Soneil® model 2412SRF 24 Volt 6 Amp (24V 6A) electric scooter/bike Constant Current™ battery charger. 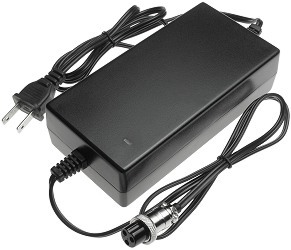 Universal 110-230 Volt AC power input. Two-color LED indicator lamp glows red when charging and green when charging is complete. This is an automatic battery charger which turns itself off when the charging cycle is complete to prevent overcharging. Includes 12 Month manufacturer's warranty. ElectriCruz® 24 Volt 7 Amp (24V 7A) electric scooter, moped or bike battery charger. 110-120 Volt AC power input. Sturdy aluminum case with power switch and cooling fan. Fuse protected, extra fuses included. Two LED status indicators glow red when battery is charging and green when the charging cycle is complete. This is an automatic battery charger which turns itself off when the charging cycle is complete to prevent overcharging. Works with electric scooters, mopeds and bikes that have two 12 Volt batteries or one 24 Volt battery pack. Designed for charging 22Ah - 55Ah SLA battery packs. Weight 3.5lbs. Includes 12 month manufacturer's warranty. 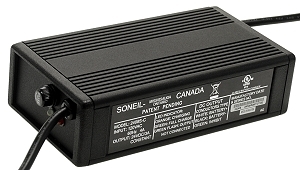 Soneil® model 2416SR 24 Volt 8 Amp (24V 8A) Constant Current™ electric scooter/bike/go kart/beach wagon battery charger with battery life prolonging desulphation mode technology. Switchable 120/230 Volt AC power input. Three-color LED indicator lamp glows red in desulphation mode, orange in charging and equalizing mode, and green when charging is complete and charger is in float mode. This is an automatic battery charger which stops charging when the charging cycle is complete to prevent overcharging. Power cord included. Two mounting flanges with slots that allow permanent mounting with bolts or screws to a vehicle or wall. Weight 3.5 lbs. Includes 12 Month manufacturer's warranty. Replacement electric scooter battery charger power cable for battery chargers that use a 3-port house/IEC (pc computer style) power input cable. This power cable goes between the power outlet on the wall and the battery charger. Electric Scooter Parts stocks a large selection of 24 Volt battery chargers for electric scooters, electric bicycles, electric pocket bikes, electric go-karts, and all other types of small ride-on electric vehicles. 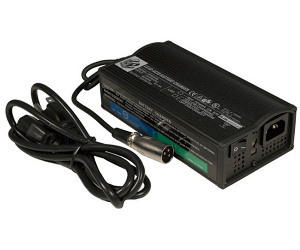 These type of battery charger are sometimes called Intellect Chargers on the existing battery chargers nameplate. Most of Electric Scooter Parts 24 Volt battery chargers are designed for charging standard sealed lead-acid (SLA) batteries however we also have 24 Volt battery chargers available which are designed for charging specific Li-on and Nimh battery packs. 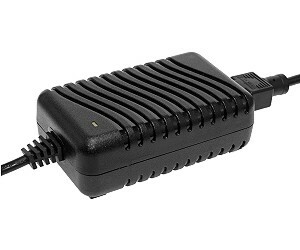 If you need help choosing the correct 24 Volt battery charger for your electric scooter, electric bike, electric go-kart, electric pocket bike, electric dirt bike, or other small ride-on electric vehicle please do not hesitate to contact us.